"The owner of the company had no business putting a failed vehicle on the road," Gov. Andrew M. Cuomo said, adding that the owner could face consequences, both civil and criminal. 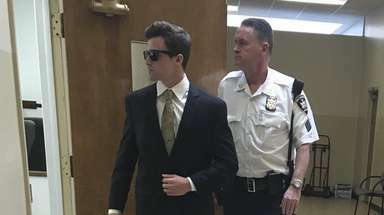 COLONIE — The driver of the stretch limousine that crashed Saturday, killing 20 people, was unqualified to get behind the wheel and the rented vehicle had failed repeated safety inspections before it sped through a notoriously dangerous intersection, state officials said. "The owner of the company had no business putting a failed vehicle on the road," Gov. Andrew M. Cuomo said in a news conference Monday. "The vehicle was inspected last month, failed inspection . . . The driver did not have the appropriate license," he said. "It is really tragic. It reminds us all that every day is precious." 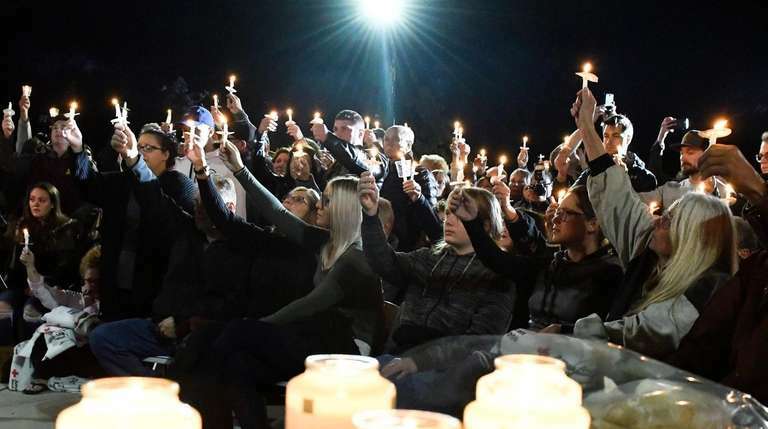 As investigators tried to piece together the puzzle of the horrific crash, which killed all 18 people in the limo and two pedestrians, more than 1,000 people jammed a riverside park to honor the victims. The crash was the nation's deadliest transportation accident in almost a decade. 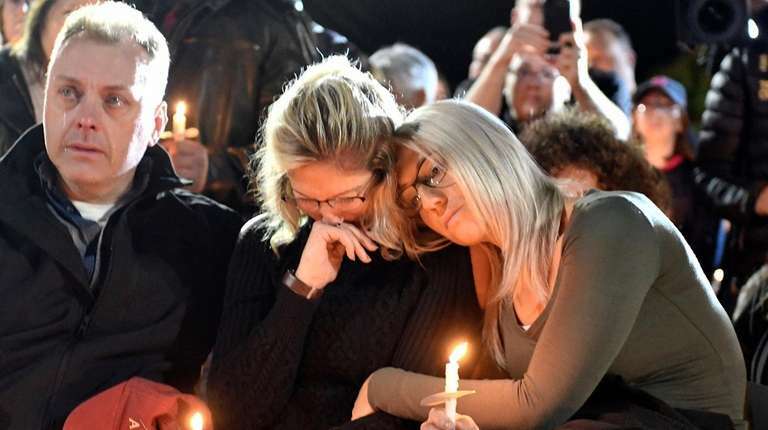 Some relatives of the dead shed tears as local officials expressed solidarity with them at the vigil in Amsterdam, home to some of the victims. U.S. Rep. Paul Tonko, a Democrat from the area, told the families, in his words, “We are crushed with you, we are crushed for you,” The Associated Press reported. The ceremony ended with participants lifting candles above their heads to signal unity and perseverance. The crash took place Saturday afternoon in Schoharie County, west of Albany. The driver failed to stop at a stop sign at an intersection and crossed into the parking lot of a restaurant, hitting two pedestrians and a parked vehicle, police said based on a preliminary review. 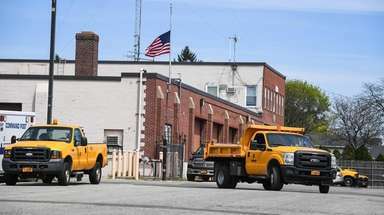 State Police and a team from the National Transportation Safety Board said Monday they were examining the snarled metal of the 17-year-old Ford Excursion, which had been chopped and welded into a stretch limo. A key may be the air bag control module of the limousine, which State Police Maj. Robert Patnaude termed the "black box" of auto accidents, referring to the data recording device usually associated with aircraft. The limousine rental company, Prestige Limousine of Gansevoort, issued a statement on Monday expressing condolences to the relatives of those killed and saying it was "performing a detailed internal investigation to determine the cause of the accident.’’ State officials issued an order for the company to stop operations but it said it "voluntarily" took its vehicles off the road. Cuomo had said the vehicle in the crash had failed its most recent inspection, and a state source said it had failed another inspection in March. A U.S. Department of Transportation report said the company, which also operated as Chauffeur Service, Saratoga Luxury Limousine and Hasy Limousine, all with the same Gansevoort address, reported no accidents in the past 24 months.The report states the company had five inspections in the past 24 months and, as a result, the vehicles were taken out of service — even if only for a short time — four times. Cuomo said the owner could face civil and criminal charges. Patnaude said Shahad Hussain, the owner of the limousine rental company, was out of the country in Pakistan. State Police said an investigation is underway on the mechanical soundness of the vehicle. Hussain didn't return calls or an email seeking comment left at his businesses. In 2010, Hussain was a key prosecution witness in open court and identified as an FBI informant in an anti-terrorism case. State Police said the passengers were texting and using social media before the crash and that those statements are being analyzed. Patnaude said they had sought to rent a limo or bus from another company, but were unable to reserve a vehicle until they contacted Prestige. "They scrambled and found this company to satisfy their needs," he said. The impact pushed the engine into the front seat and snapped some seats from their moorings, and that damage is hampering the investigation. For example, the small plate that usually shows a vehicle was safely stretched into a limousine under federal safety standards isn't where such a plate should be located. Investigators are still looking for it amid the rubble. Investigators also don't know if the brakes were applied, seat belts were worn or how fast the vehicle was traveling. "There were no apparent skid marks, but like today, the weather was misty and that could perhaps mitigate any skidding,” NTSB investigator Pete Katowksy said of the crash. “We’re not sure at this time if the seat belts were worn by anyone,” said Robert Sumwalt, chairman of the National Transportation Safety Board and leading the federal safety investigation. Under federal law, large limousines aren’t required to have seat belts for passengers who don’t face forward, which is a configuration common for most seats in large limousines. Sumwalt said investigators have met with company representative, and the company "has indicated a willingness" to comply with their record request. Investigators are also looking at the T-intersection of routes 30 and 30A, which is at the base of a steep hill that has long frightened local residents. Two tractor trailers rammed through the intersection in 2015 and 2016 at nearly the same spot the limousine did. The state has since banned tractor trailers from the intersection. Investigators say they have no official cause for the crash and won't speculate. The investigations are expected to take at least the rest of the week and the experience may be used to re-evaluate limos nationwide. “We are here to investigate this particular crash,” Sumwalt said. “Our ultimate goal is to keep things like this from happening again." 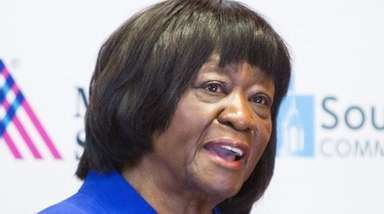 In 2017, Gov. Andrew M. Cuomo and the State Legislature passed a law requiring taxis, liveries and buses including large limos to adhere to the state seat-belt law. These vehicles had been exempted, but fatal bus and limo accidents prompted the legislation. The law requires operators of such vehicles to have seat belts for passengers younger than 16 when they sit in the front seat. The measure, however, doesn’t require all passengers in the rear seats to wear seat belts. Under federal law, large limousines aren’t required to have seatbelts for passengers who don’t face forward, which is a configuration common for most seats in large limousines. In the limousine involved in the crash, most passengers did not face forward. According to Cuomo, the limousine involved in the crash was a Ford Excursion that had been cut and then “extended.” When a vehicle goes through such a conversion, it is supposed to have a federal certification that the work was done according to federal safety standards. The state Department of Transportation also requires the owner of any stretched or modified vehicle to contact the state for additional safety inspection requirements to make sure the vehicle meets criteria for vehicles designed to carry more than 10 people, including the driver. Several safety measures aimed at limousines were proposed in the 2018 legislative session, including one to prohibit U-turns by limos following a fatal 2015 crash in Cutchogue. The crash prompted a Suffolk grand jury to issue a 2016 report over the lack of regulation in the construction of stretch limousines. That bill died in committee. Lives of close friends and family cut short by limo crashThe group of 17 friends and family members were enjoying a festive fall Saturday upstate when their lives, along with that of their limousine driver, came to an abrupt end.